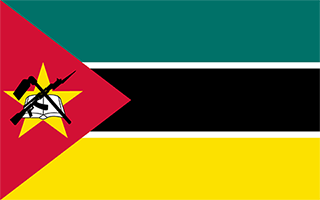 Mozambique with its capital Maputo is located in Africa (Southeastern Africa, bordering the Mozambique Channel). It covers some 799,381 square kilometers (slightly more than five times the size of Georgia) with 26,573,700 citizens. Portuguese is the language commonly spoken used by the people in Mozambique. Malawi, South Africa, Swaziland, Tanzania, Zambia and Zimbabwe are bordering countries. Mozambique is a country on the Indian Ocean coast of Southern Africa. From the 2,436m Monte Binga peak to the stunning beaches along the coast, Mozambique is a country of contrasts. As well as some of the best colonial era architecture and relics to be found on the continent, Mozambique has also preserved its African cultural heritage, which can be experienced through art, music and food. Almost all of Mozambique falls within the tropics and as such, Mozambique features a mostly tropical climate. To reach someone Mozambique dial +258 prior to a number. The local cellular networks are operated on 900 MHz, 1800 MHz, 3G, 4G. Websites typically end with the top level domain ".mz". If you want to bring electric appliances (e.g. battery chaarger), keep in min the local 220 V - 50 Hz (plugs: C, F, M). The sign for the locally used currency Meticail is MZN. Three equal horizontal bands of green (top), black, and yellow with a red isosceles triangle based on the hoist side; the black band is edged in white; centered in the triangle is a yellow five-pointed star bearing a crossed rifle and hoe in black superimposed on an open white book; green represents the riches of the land, white peace, black the African continent, yellow the country's minerals, and red the struggle for independence; the rifle symbolizes defense and vigilance, the hoe refers to the country's agriculture, the open book stresses the importance of education, and the star represents Marxism and internationalism. Almost five centuries as a Portuguese colony came to a close with independence in 1975. Large-scale emigration, economic dependence on South Africa, a severe drought, and a prolonged civil war hindered the country's development until the mid-1990s. The ruling Front for the Liberation of Mozambique (FRELIMO) party formally abandoned Marxism in 1989, and a new constitution the following year provided for multiparty elections and a free market economy. A UN-negotiated peace agreement between FRELIMO and rebel Mozambique National Resistance (RENAMO) forces ended the fighting in 1992. In 2004, Mozambique underwent a delicate transition as Joaquim CHISSANO stepped down after 18 years in office. His elected successor, Armando GUEBUZA, served two terms and then passed executive power to Filipe NYUSI in 2014. RENAMO’s residual armed forces have continued to engage in a low-level insurgency since 2012.